Get to know U.S. Bellows from introducing our team and manufacturing capabilities to exploring design details in technical drawings for large-scale projects. View case studies that lead to the creation of new standards and designs. Learn about cost saving measures for expansion joint failures and how to prevent future problems. U.S. Bellows, Inc., a division of PT&P, has more than 50 years of experience designing and manufacturing expansion joints, along with replacement and repair services. 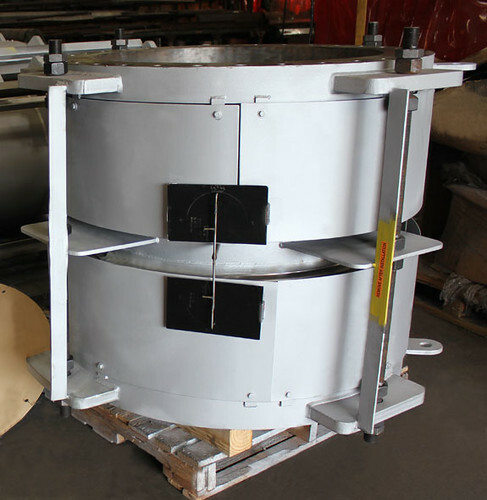 U.S. Bellows custom designed universal expansion joints for an oil refinery in the Philippines. The bellows and liner are fabricated from 304 stainless steel and the cover, tie rods, flanges and pipe spool are carbon steel. The sizes are 18″ dia. x 60.5″ long, 28″ dia. x 80.75″ and 36″ dia. x 40″ long. The units are designed with movement indicators and for 50 psig at 655°F. They are capable of 0.675″ compression, 0.375″ lateral and 1″ angular. The bellows and pipes were 100% x-rayed, PMI examined and hydro-tested.